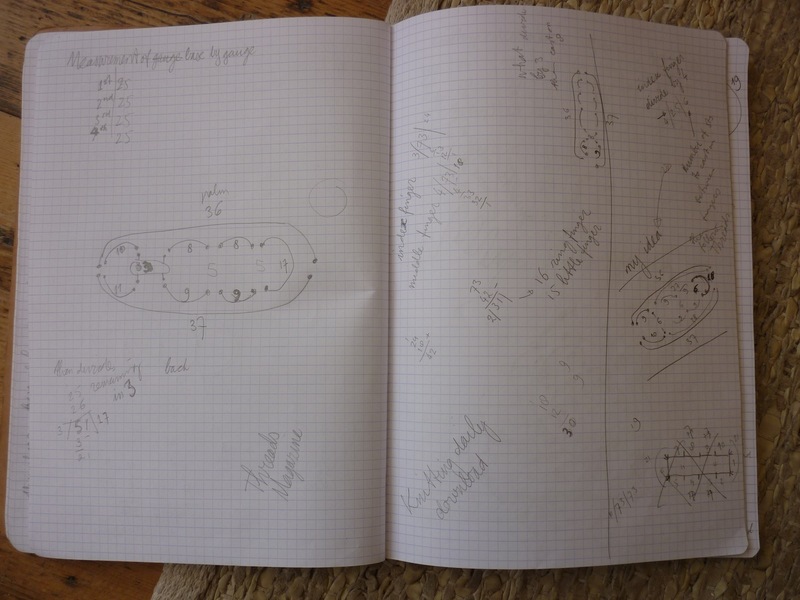 In my last post I talked about my participation in the Sanquhar Workshop, organised by the Knitting in the Round initiative from the University of Glasgow. Today I’d like to tell you little bit more about the history of knitting in Sanquhar and how I got interested in this subject. 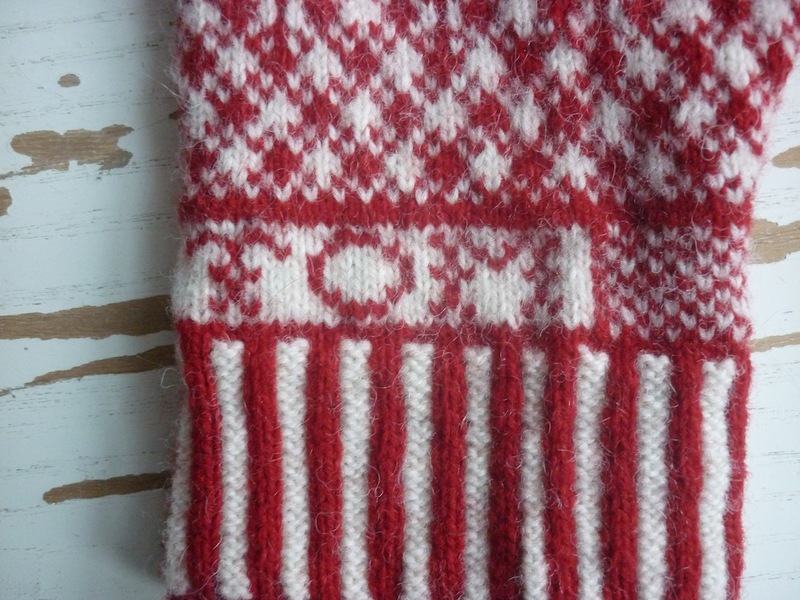 About five years ago I learnt how to knit gloves, and like many knitters, I started browsing Ravelry for nice patterns. That’s where I first encountered the amazing Sanquhar gloves. Never having done any stranded colourwork, I’m not sure why I ordered all four available patterns from the Scottish Women’s Rural Institutes not soon after. It was a steep learning curve for me, but at the same time as I was struggling to knit my first pair, I researched the knitting tradition of the town of Sanquhar, which incidentally, can also claim to have the oldest post office in the world, dating back to 1712. The first knitters in Scotland were highly paid craftsmen of the 16th and 17th century, but by the mid 1700s knitting skills had spread throughout the country and created a thriving cottage industry, mainly producing knitted stockings. The entire Scottish hand-knitting industry declined dramatically in the late 1700s, due to a variety of reasons, amongst others the loss of trade to the American Colonies, and the increasing industrialisation of spinning and processing wool. 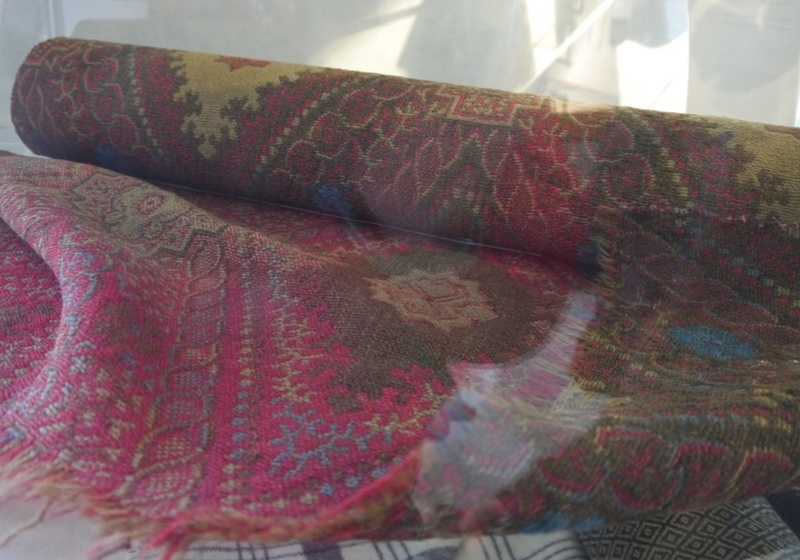 It was most probably around the late 1700s that the distinctive two-colour patterns developed as an attempt to create a product that stood out and thus protect the livelihood of local knitters. 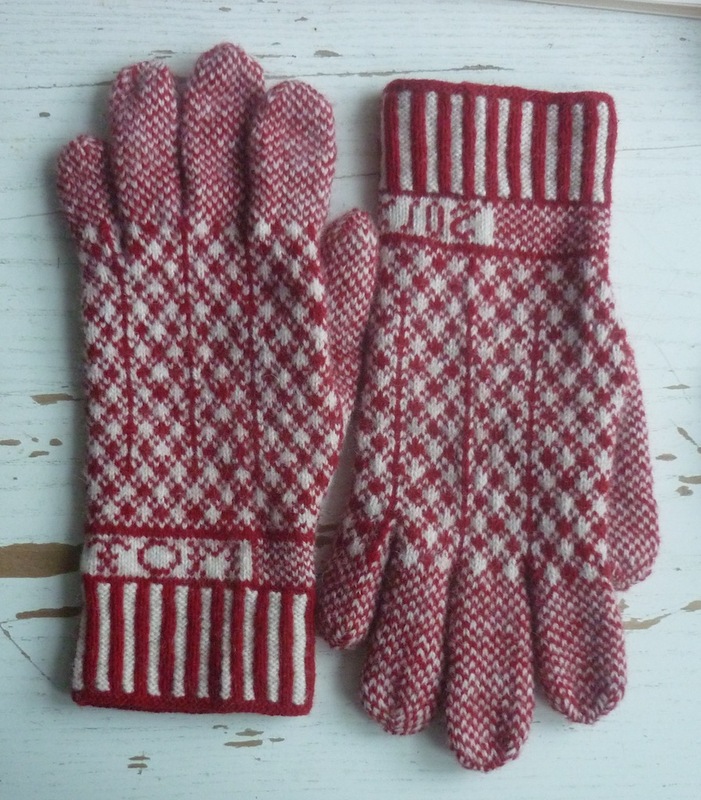 Thomas Brown, a Sanquhar printer, noted in his Union Gazeteer of Great Britain and Ireland (1807), that the stockings were ‘almost peculiar to the place…parti-coloured and of great variety of patterns.’ Mittens, and rather later, gloves were made in the same manner. One feature of good eighteenth-century stockings was that the customer’s name or initials could be worked into the tops. 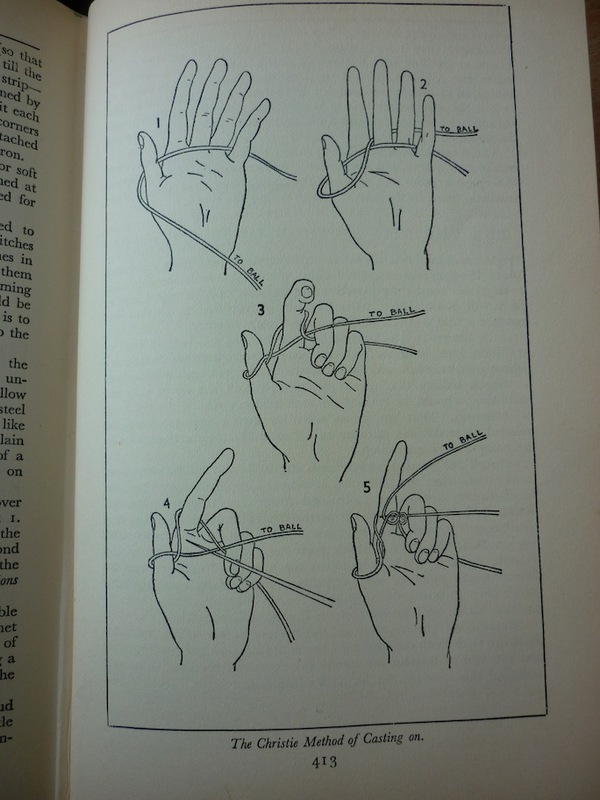 This may be the origin of the Sanquhar practice of working these into the wrists. Although Brown doesn’t mention it, this was a feature by the 1890s. 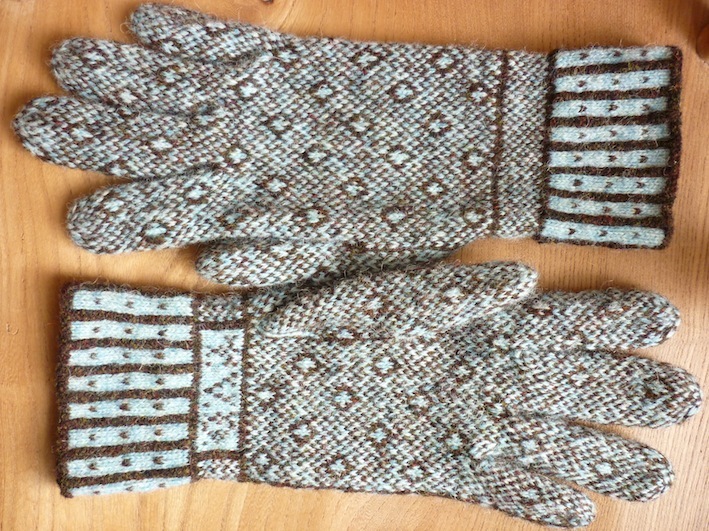 The gloves were knitted from a yarn referred to as ‘drugget’ and this appears to be a wool/linen or a wool/cotton blend. The knitters sourced this yarn from the nearby John M’Queen’s Mill in Crawick, where it was used in the production of carpets. Hand knitting as a cottage industry died out in Sanquhar during the 19th century, but the tradition has survived. The presentation of specially knitted gloves to the Cornet and other principals during the annual Sanquhar Riding of the Marches Festival is still an important part of these celebrations, when all the horse riders of Sanquhar ride around the boundaries of the burgh. Today Sanquhar knitting is rarely made for sale. Nonetheless the style remains a favourite with keen knitters, with pattern leaflets available from the Scottish Women’s Rural Institutes and other sources found on the internet. 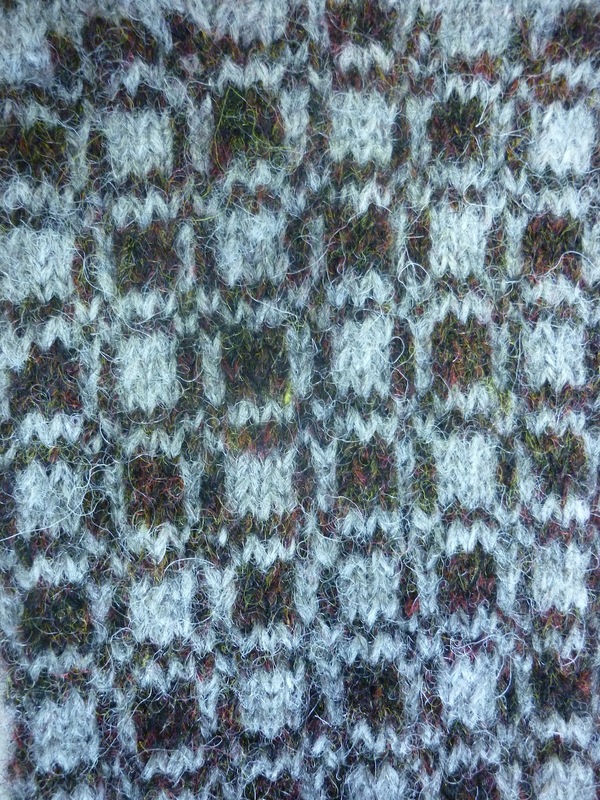 Sanquhar knitting is worked in two shades throughout. Although black and white are most common, other colour combinations regularly found are yellow and brown, and red and green. The patterns show a resemblance to other erstwhile thriving cottage industries in Cumbria and the Dales; small and intricate, the two yarns are worked into a close fabric, with no long strands. One particular refinement of the gloves are the small finger and thumb gussets, which improve fit and relieve stress points in the fabric where the fingers join the hand. 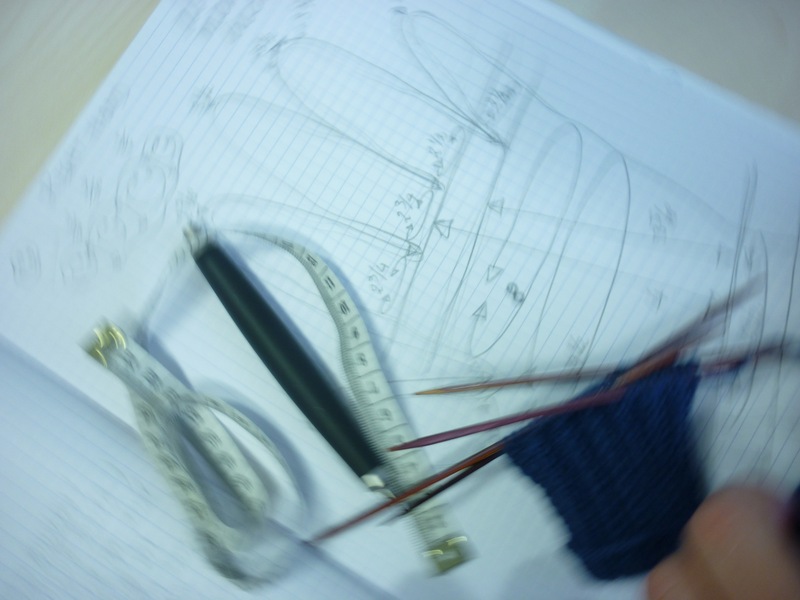 The stitch patterns can be divided into two main types. Firstly the so-called dambrod patterns: a grid of black lines on a white ground, filled in with diamond or saltire variations. Secondly check and tweed patterns: all-over patterns in diagonal checks, and small motifs scattered on a spot pattern background. It’s likely some of the patterns were named in honour of local benefactors and visiting dignitaries, like the Dukes of Queensberry and of Buccleuch, who gave large orders for gloves, and the Prince of Wales, who was entertained by the Duke of Buccleuch in 1871. The Glendyne pattern was named after Robert Nivison when he took the title Lord Glendyne of Sanquhar. 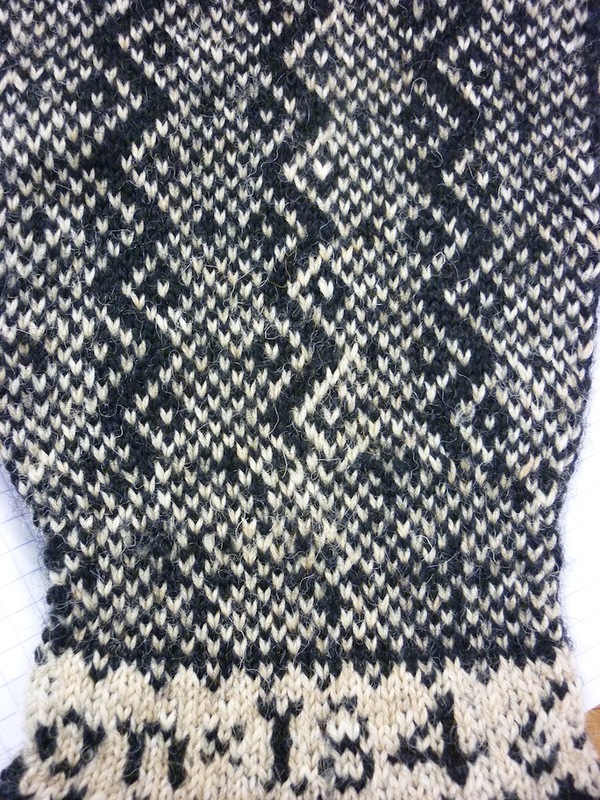 The cuffs are knitted in black and white ribbing or broken ribbing. It is customary to work the wearer’s initials in the wrist. 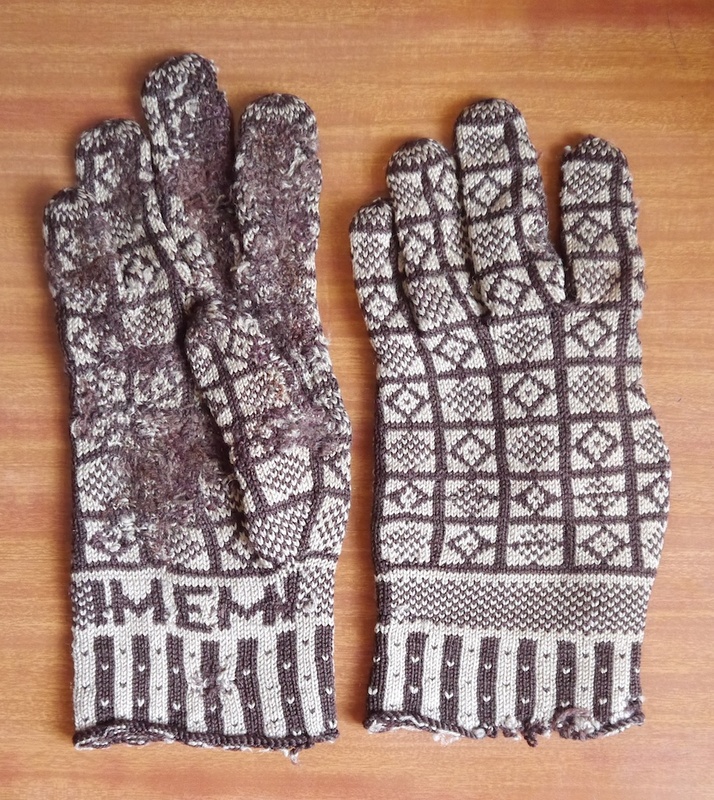 As the patterns fit around the gloves just so, the size of the gloves is altered by changing the tension: thicker needles for larger gloves, thinner needles for smaller gloves. First and foremost it’s important to knit a decent sized tension swatch in the round. Read through your pattern and work out how many stitches go round the hand, as sometimes this is more than the number of stitches you cast on. Measure around your hand and work out what your tension should be for a good fit. The most common alteration to the traditional patterns is probably the cast-on: one way to avoid the cast-on edge curling over, is to use a variation of the long-tail cast-on sometimes called twisted German cast-on, followed by two rows of purl, before starting the ribbing. 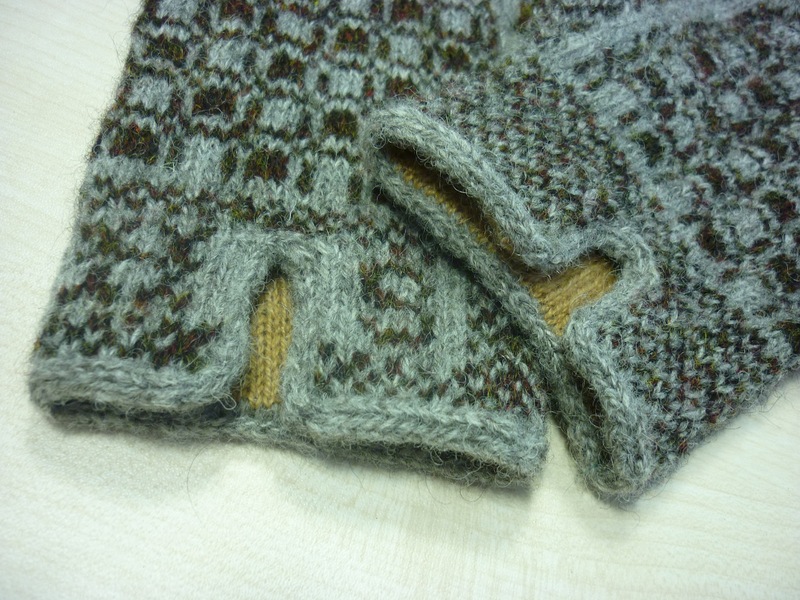 An other alteration often seen on the Ravelry Sanquhar group is to stagger the finger gussets at the correct height according to the wearer’s hand, rather than all on the same round. 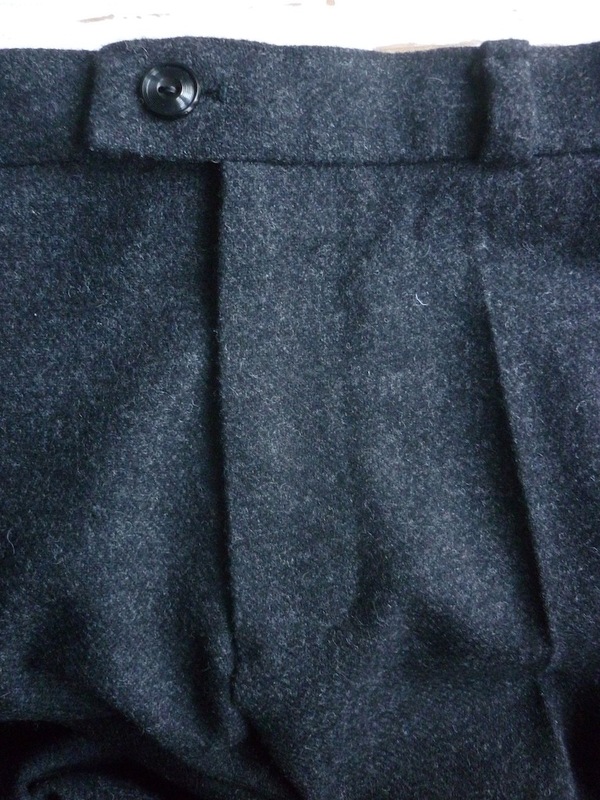 A personal alteration is to decrease 5% in the black round after the cuff to narrow the wrist. Then, after knitting the wrist, I increase back to the original number of stitches. 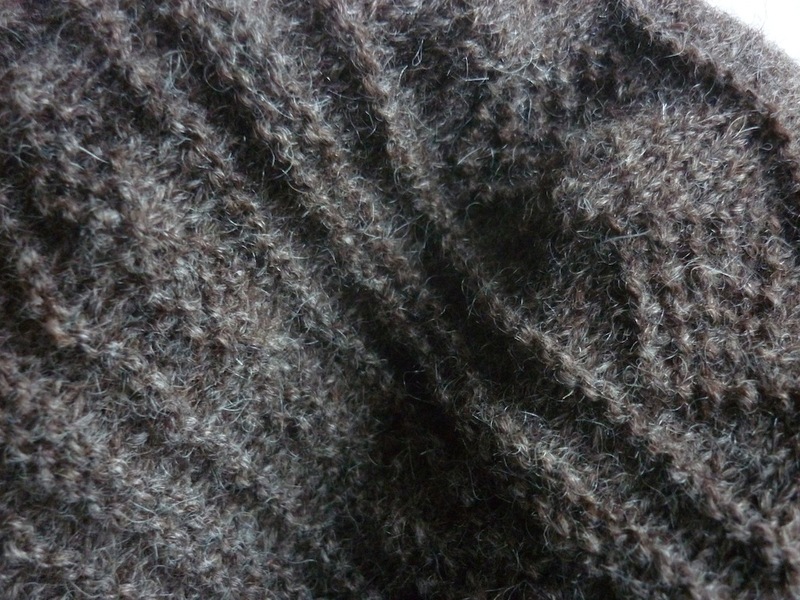 This makes for a more comfortable fit, especially as ribbing in stranded colourwork doesn’t pull in. You can read more about the Sanquhar knitting tradition on the FutureMuseum website, the Dumfries Museum website, and about Riding of the Marches on the committee’s website. Last weekend two long longed-for visits happened all at once. 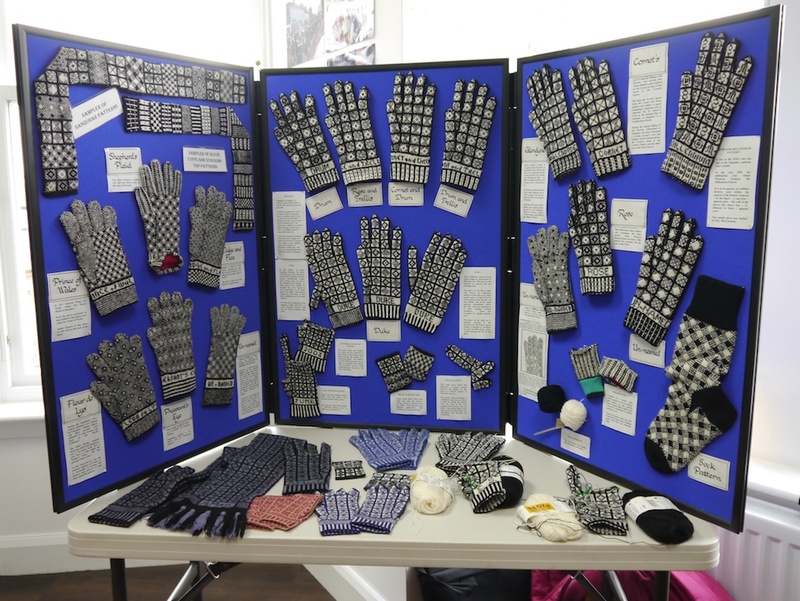 Some of you may know that I have a bit of a “thing” for the gloves knitted in the Scottish Royal Borough of Sanquhar, and I had always wanted to visit the local Tolbooth Museum where there’s a lovely display of these gloves, with a wealth of information. So you can imagine I didn’t hesitate when Professor Lynn Abrams asked me to give a presentation at a Knitting in the Round event set in Sanquhar itself. The event was very informal and convivial. Lynn Abrams presented on knitting in the Scottish landscape – wool has always been very important in Scotland in many different ways. 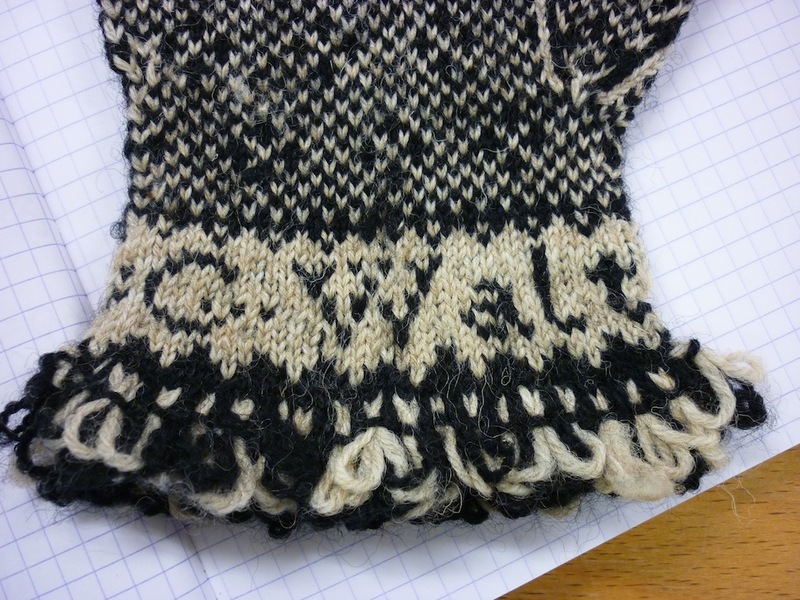 I did a presentation on the history of Sanquhar knitting, and how the old patterns and gloves to this day have inspired knitters the world over. A very tasty lunch was available in the café of the A’ the Airts Centre, where the event was hosted. 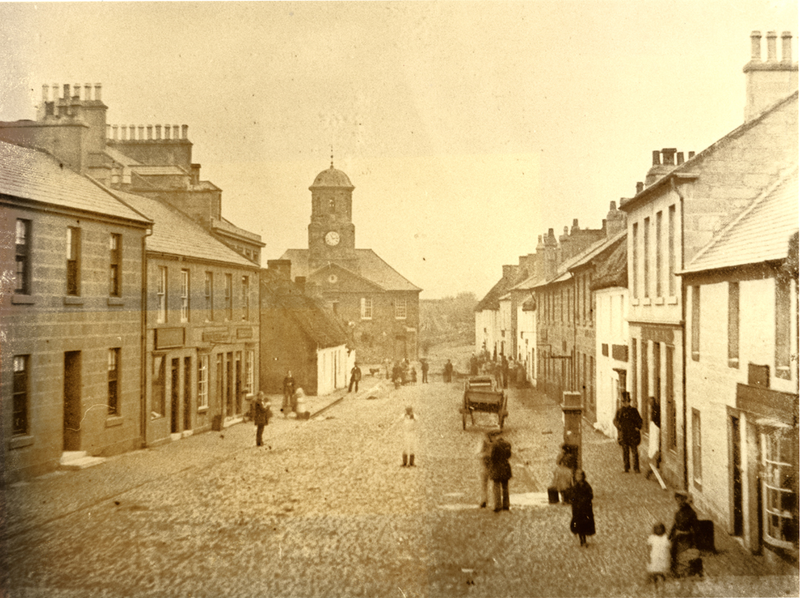 The Tolbooth museum had a small but perfectly formed permanent exhibition on the gloves. They also had a handling collection, which contained, amongst others, a number of gloves belonging to one lady cyclist. Most of these were darned on the palm side; you can imagine I was elated to see these! So, what about that other visit, I hear you ask? Well, I also got to meet a good friend whom I had not met before. How? In the age of email and internet, this is possible. Through our mutual friend Dr Felicity Ford, better known perhaps as KNITSONIK, I have known Kate Davies for a few years now, and we’ve worked on Wovember together. We have been scheming to meet up in real life for such a long time, and my visit to Sanquhar finally made this possible. We spent many happy hours together, talking about small things and large, eating food and drinking tea, and going for a long drive. 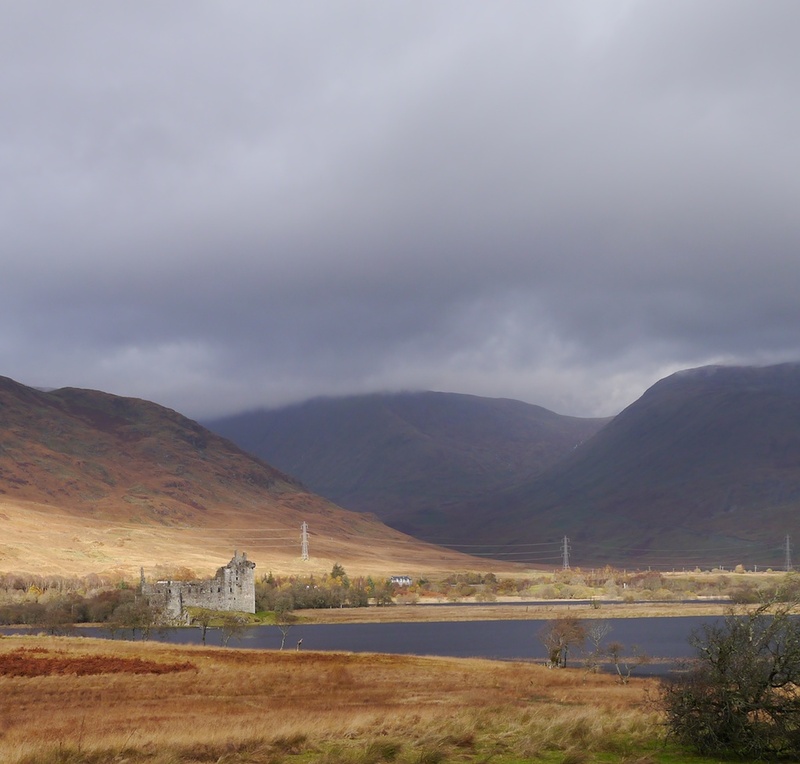 My first time in the West Highlands and I could tick off all typical attractions in one go: castle ruin, tick; loch, tick; glenn, tick; mountain, tick! 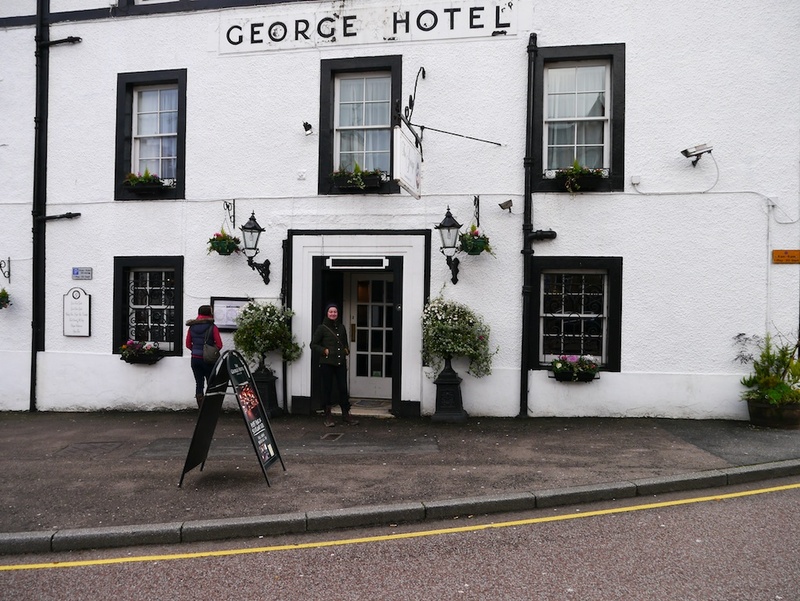 We had a gorgeous lunch at the George Hotel at Loch Fyne – the only place that Samuel Johnson managed to enjoy when he visited Scotland. If this has made you curious about the knitting in Sanquhar, then keep an eye out for my next blog post, where I will go into a bit more detail of the history of Sanquhar knitting. In preparation for my Hand in Glove Workshop at Prick Your Finger, I have knitted a pair of gloves for my friend Howard. 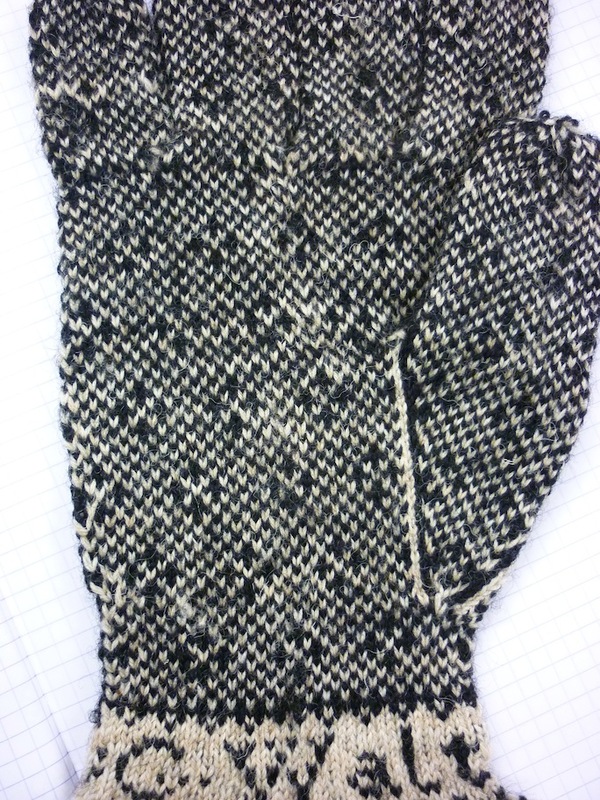 He liked my Sanquhar Gloves and houndstooth patterns, so I decided to throw them together. 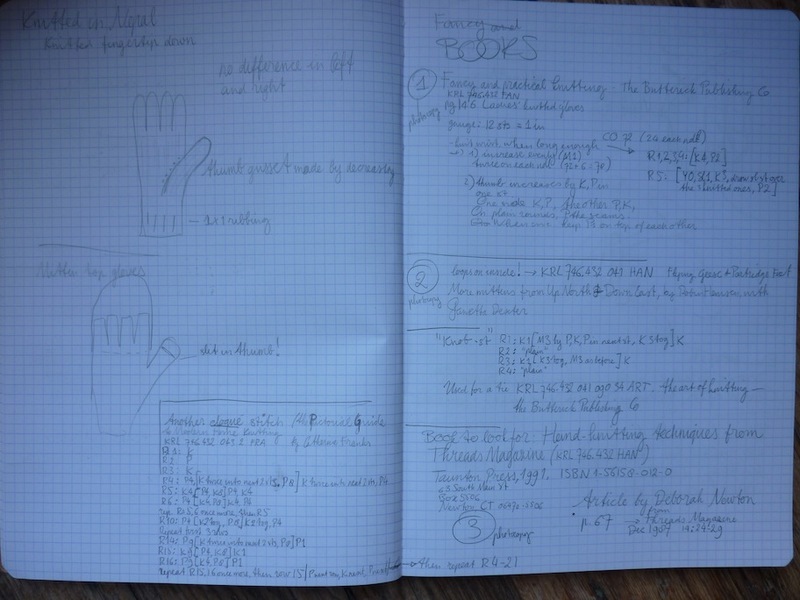 Although we will be knitting a plain stocking stitch glove for the Hand in glove Workshop, you still need to make the same measurements and calculations, so I tried out a few things for the workshop with my very patient friend. If you can’t try out whilst knitting, which was the very reason I wanted to make some gloves for somebody else I couldn’t readily meet up with, then I think that the maths provided in Hand-Knitting Techniques from Threads Magazine (although long out of print, try to get your hands on a copy, it has so many good articles in it) is your best bet. 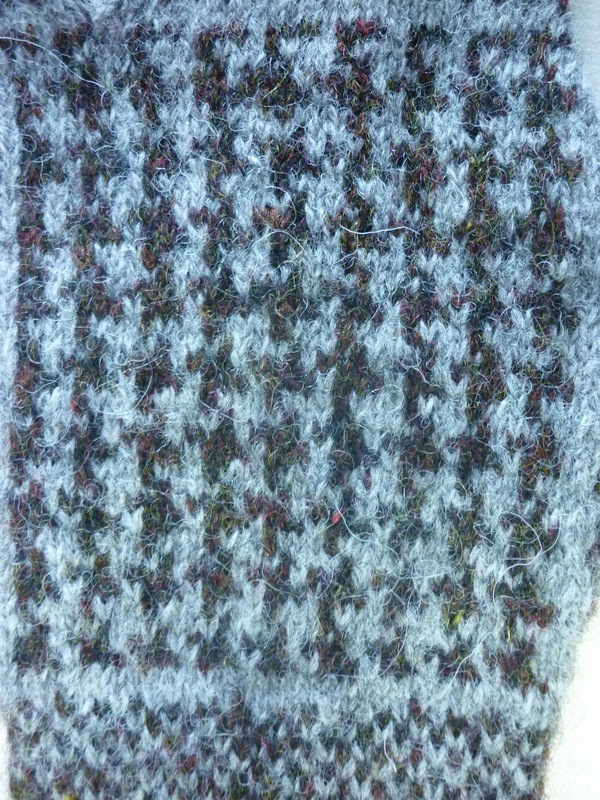 I say simple, but I did have difficulty getting the tension right for the row that makes the top of the brown check. 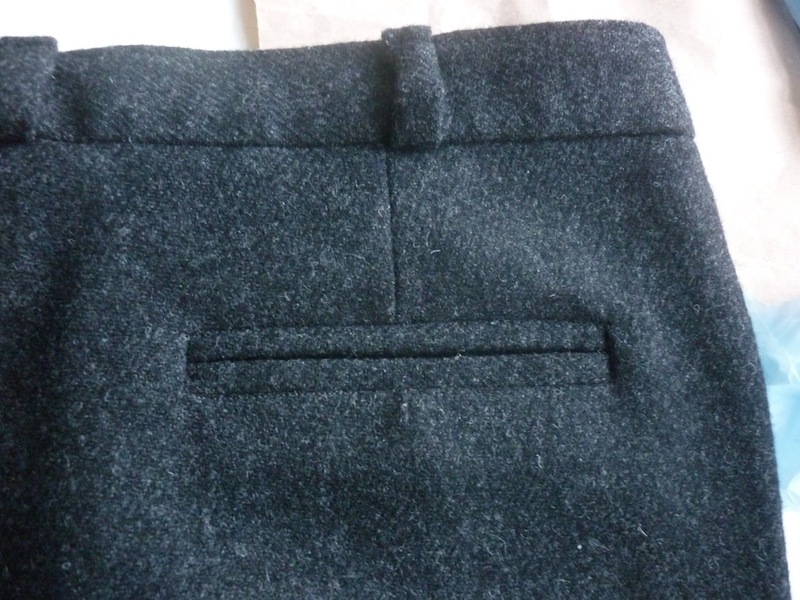 Whatever I tried, the grey stitch immediately left to the brown stitch just disappears. 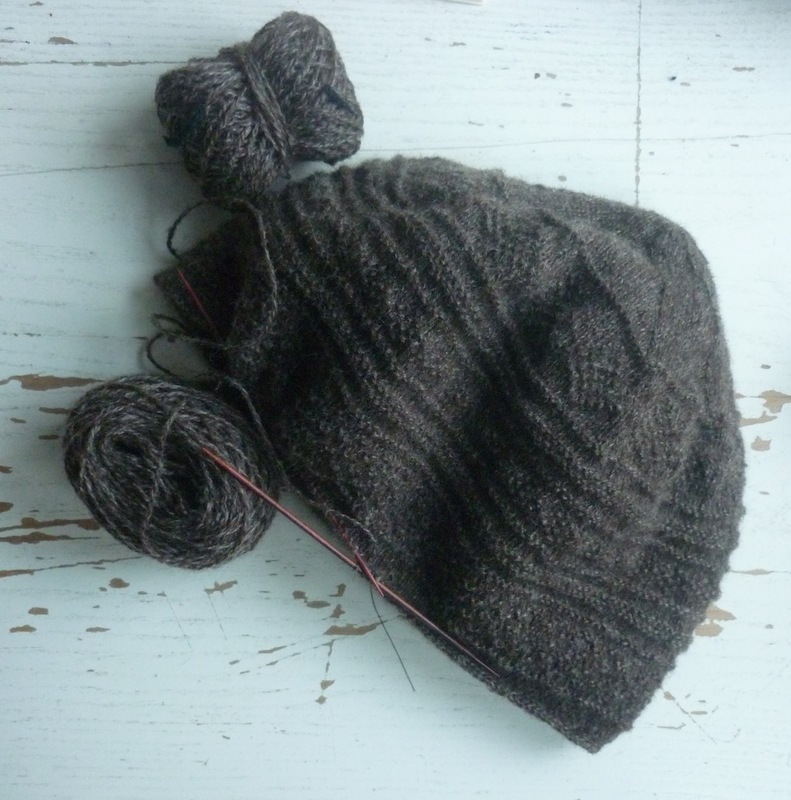 However much I love my Shetland Spindrift, the sholmit (that’s the Shetland name for this particular colour of natural grey) was a bit thicker than the brown, which made even tensioning that little bit harder still. Luckily blocking has sorted most of it out. 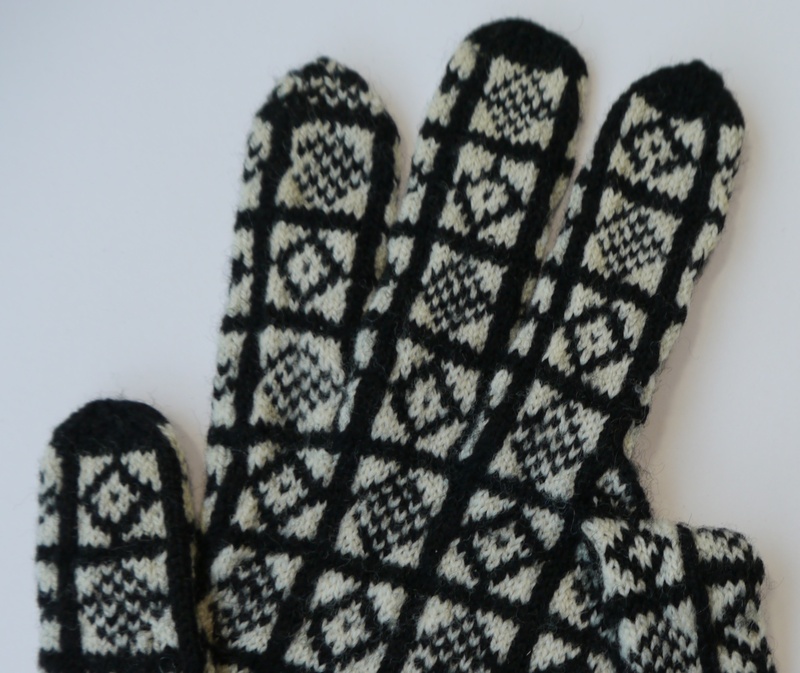 If the prospect of knitting a pair of gloves makes your head spin, then fear no longer: I will be running a glove knitting workshop at Prick Your Finger over three consecutive Saturdays, starting on 28 January, 2012. 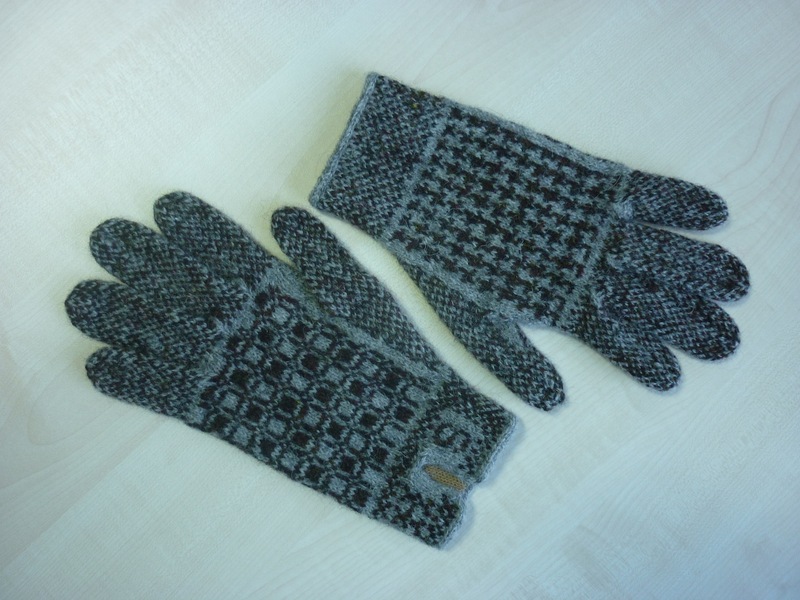 By guiding you through knitting a pair of gloves in stocking stitch in 4ply yarn, we will go through all the stages of constructing a pair of well-fitting gloves. I will cover the following areas with you: glove construction, hand measurements, provisional cast-on, increasing and decreasing, finishing techniques. 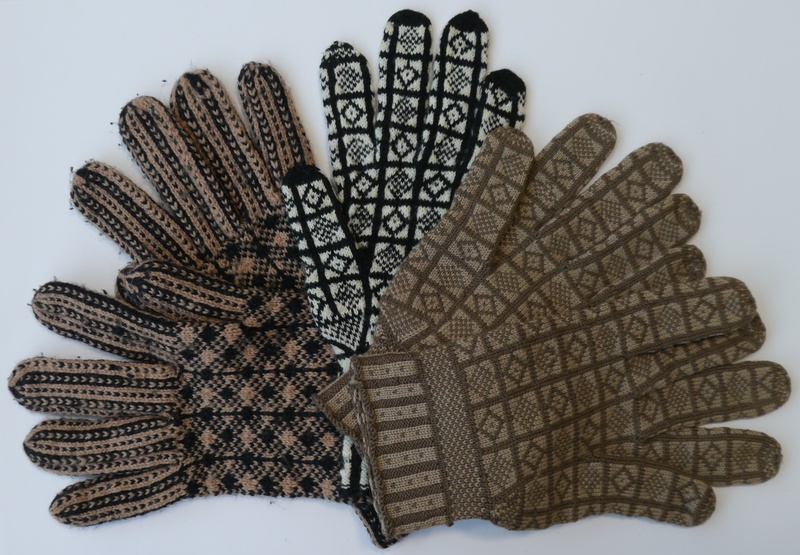 The workshop handouts will enable you to repeat the process and knit gloves to fit any hand. 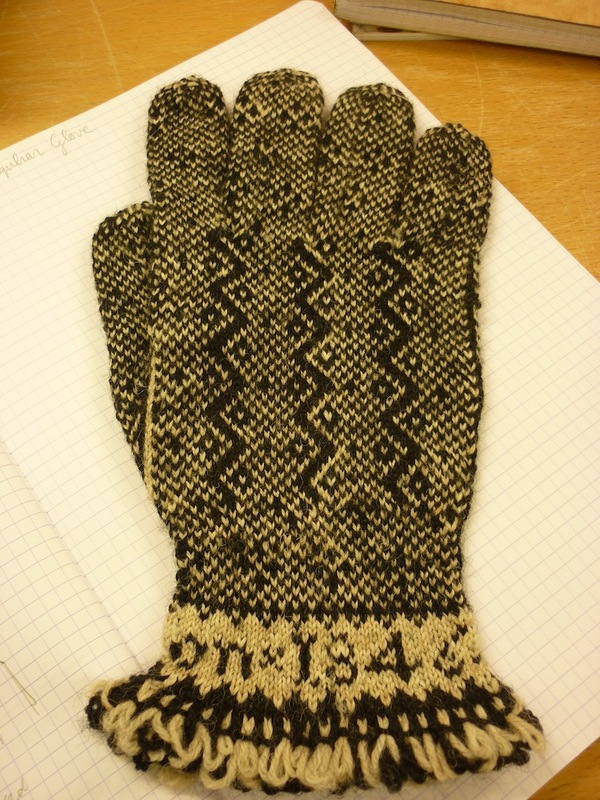 As it is not possible to knit a pair of gloves in 3 x 2 hours, you will need to do some homework during the week. But then, who in their right mind would count knitting as homework? Besides, it will give you the opportunity to try some things out for yourself. Total cost: £100. Pay £50 deposit when booking, the remaining £50 after the last class. The price includes 4ply yarn, a handy sheet to record essential measurements, workshop handouts with glove-knitting hints and tips, and all the cups of tea you might require to see you through any difficulties. Please book online HERE*, or ring Prick Your Finger: 020 8981 2560. 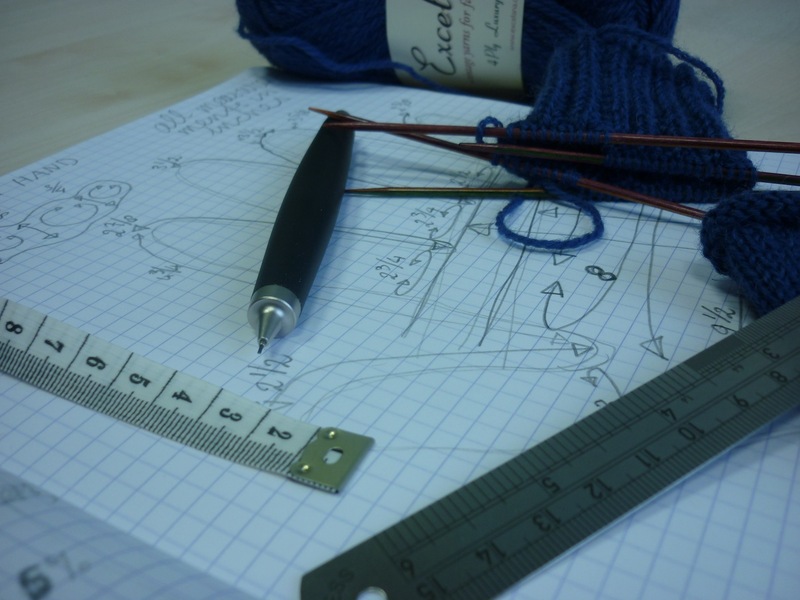 Skill level: you need to be able to knit in-the-round, either using double-pointed needles or Magic Loop with circulars, and have an understanding of increasing and decreasing. 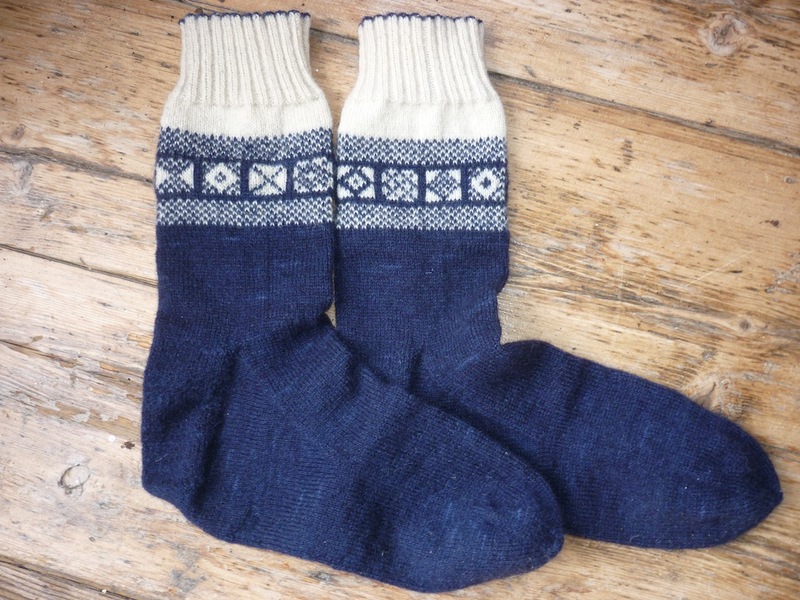 If you can knit a basic sock pattern, you will have no problem with this course. IMPORTANT: bring your own needles, size 3-3.25mm. There are only a few places left, so don’t wait too long with booking to make sure you can tackle your next pair of gloves with a steady hand! *) please note there is an unfortunate error on the workshop booking page: the total cost of the workshop is £100, not £50. Yes, the feet look ridiculously baggy, but these socks fit like, erm, a glove! And I think I have found a suitable yarn to boot.